Each year, Disneyland always ads the little hearts to the wrought-iron circular benches on Main Street, and a couple merchandise items here and there. 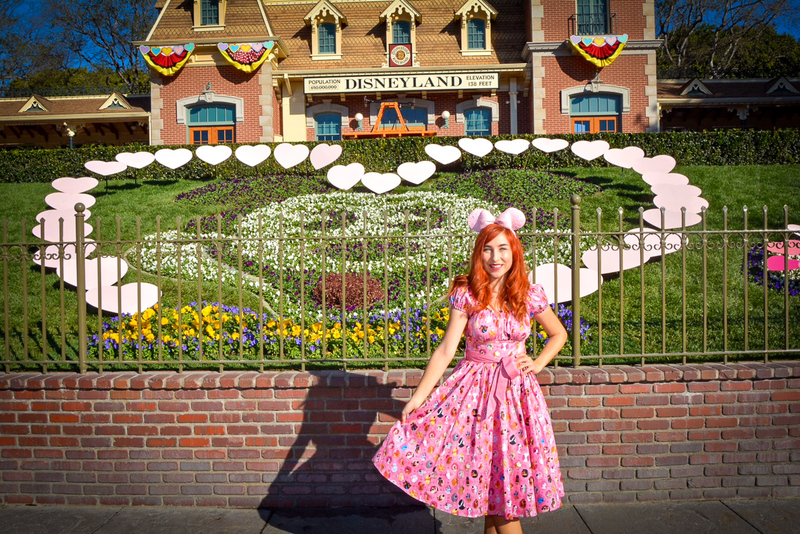 People who love the pastel heart aesthetic of Valentine’s Day will be thrilled to hear that Disneyland Resort is adding more Valentine’s offerings this year with Valentine’s Month at Disneyland! From now until February 18th, you can find Main Street USA decked out with heart decor, and a few Photopass opportunities! Side note – I’ve had a few questions about my dress. You can find it online here. When you walk in, you will see that the Mickey bloom is surrounded by hearts. With a Photopass photographer stationed there, you can start off the day with the perfect picture! Then as you walk under the train station, you will see various buildings on Main Street USA covered in heart streamers (with the same colors as the classic candy hearts), as well as the street cars decked out in Valentine’s flair. By the flagpole, you will find a Mickey & Minnie themed Valentine’s card photo opportunity, also with a Photopass photographer stationed. You can also find various merchandise like plushes and pins. Another Valentine’s addition is more seasonal treats! These are found throughout the park, you can find the complete guide to the seasonal treats here. One that stood out to me was a gluten-free and vegetarian option, the roasted vegetable spring roll at Bengal BBQ. It’s vegetarian, and then can be gluten-free if you have it without the soy sauce on the side. Aside from the Valentine’s decor, the most notable addition is the Minnie’s Valentine’s Day Surprise Scavenger Hunt. You purchase the maps and heart-shaped Disney character stickers to the left of the Mad Hatter shop on Main Street. It is $6.99, and they also offer Annual Passholder discounts. When you purchase the map to do the hunt, the prize is a set of Disney character Valentine’s Day cards. There are two sets to pick from! What I thought was nice is when you purchase the map and stickers, they give you the option to redeem your prize cards right away or once you complete the map. I decided to do the option to redeem them right away, since my daughter can get so excited to get her scavenger hunt prize that she tries to rush the hunt. Having the prize right away allowed us to take our time finding the Valentine’s Day cards throughout the park leisurely as we were naturally going about our day. Valentine’s Month at Disneyland Resort will run until February 18, 2019. While you visit, I also highly recommend making a stop at Disney’s Lunar New Year Celebration at Disney California Adventure park, happening now until February 17, 2019. You can find discount tickets, as well as ticket and hotel bundles for Disneyland Resort 2019 here.